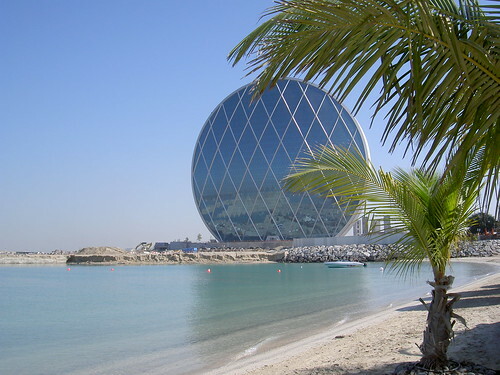 The newly constructed headquarters of Aldar Properties in Abu Dhabi has an eye catching circular shape. Many web sites have described it as coin shaped but in reality it looks more like a convex lens than a coin. 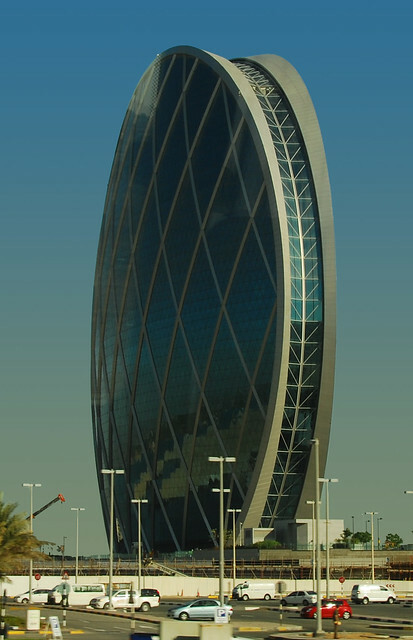 There are many circular buildings in the World which are cylindrical or barrel shaped, however the Aldar Headquarters is unique and the first building which has a circular front elevation view. 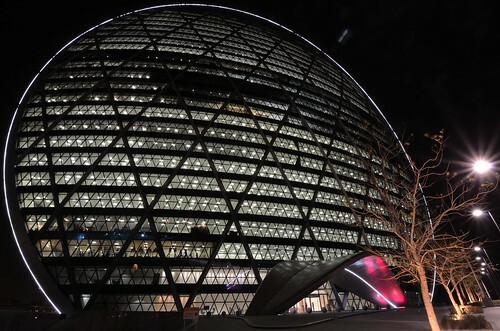 Closest building with such a design is the Fangyuan Mansion, Shenyang, China which is shaped like a stack of coins but it doesn't have a full circular elevation/façade. The unusual shape was achieved by using diagonal grid of steel known as diagrid and the Skyscraper was voted as the Best Futuristic Design by The Building Exchange (BEX) Conference held in Spain. The 110.03 metres high, 23 storey building was completed in end 2010. It has floor area of 61,900 square metres (666,000 sq. ft.) and beside having the headquarters of Aldar Properties, it will also cater to other commercial offices. Image from Flickr is by melgrey1. Image is used here after due permission.